Need excavation in tight, awkward spots? Try All Coast Mini Excavations! 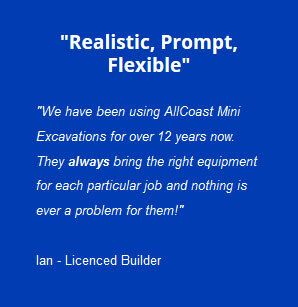 "We have been using AllCoast Mini Excavations for over 12 years now. They always bring the right equipment for each particular job and nothing is ever a problem for them!" You would be surprised at what we can do for you so why not give us a call today so we can arrange a time to come and see your project and advise you the best way to tackle it! 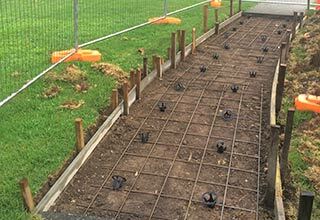 We are experts in preparation for concrete footings, slabs, driveways, pathways and much more!. Got a job that needs doing but it's in a tight spot or has very limited access? We're here to help with that! Whether you have a small landscaping job or a large project which needs big muscle, we've got you covered! We are constantly working with all Tradies, from Plumbers to Electricians and builders. Call us today for reliable service. 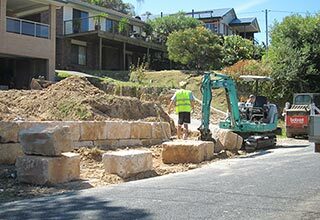 Allcoast Mini Excavations are a locally owned family business servicing the Central Coast & Surrounds. Our operators are highly skilled & trained in all areas of excavation scope of works with over 20 years experience in the field. Our operators are licensed, fully insured, Worksafe compliant and are accredited to work on Government sites. We strongly believe in delivering quality work at a competitive price. We are dedicated to providing our customers with a professional, reliable, prompt service that you can count on. 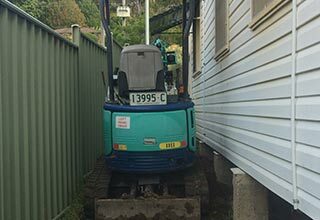 Allcoast Mini Excavations are your tight access specialists for all your indoor, outdoor & under house excavation needs. 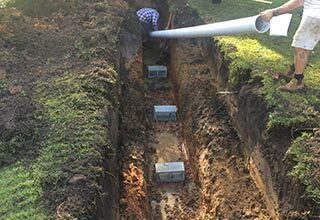 Whether you need drainage, trenching, pool dig, or driveway removal, we have all the machinery and accessories to get the job done. Want your backyard landscaped but have tight access issues? No worries, we have machinery that can get access through a garage to as small as a standard doorway, that’s 700mm wide how handy is that. Need a driveway removed? No problem. We have a hammer attachment to break-up that concrete which will not only save you time but save you money too. Need pier holes drilled? To easy. We have all sized Augers, so you can complete your job. Call Allcoast Mini Excavations now to see how we can best look after you. For sharing our content and supporting our website, we appreciate it very much!